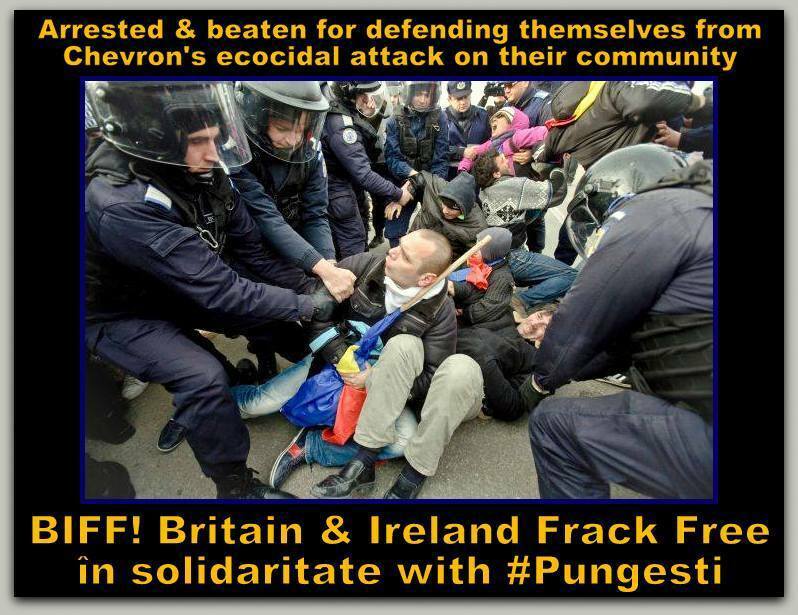 Terror in #Pungesti and whole of Romania due to Fracking operations of Chevron! Chevron has started a real war against the Romanian people, backed by the Romanian government, while using the heavy and brutal arm of the militarised police, the Riot Police. In a country where the property rights are blatantly breached, the freedom to express is abusively prohibited, the right to free movement is restricted, we desperately need international solidarity! Yesterday, the 7th of December, was a war day little covered and debated in Romania in the media, as expected. In the first round, people, who have gathered there to send out a message to Chevron and to the Romanian Government, who has done everything to impose Chevron's fracking project, pulled down the fence surrounding the land where Chevron abusively and illegally and despite the huge opposition of the local community, started erecting its first rig on Romanian territory. 20 people were arrested, others injured in the fights after, mainly to release the arrested ones. The camp was fully evacuated and destroyed by the Riot Police for the reason of insalubrity! They accused the people of possession of white weapons (totally false) and flamable materials! In the camp, they only kept the gas for the generator used to fuel the camp with energy! The Riot Police waited for the night to fall and sent out troops to the houses of the locals to look for guests (no real activists, whatsoever, mostly citizens who came there out of solidarity with the abused people of Pungesti), beat them up in their own yards, broke inside the homes and fined the people hosting non-local protesters and beat them up, while people were hiding fearful in their homes, with the lights switched off and whispering in the dark. Prior to this, the Riot Police made look like the protesters have thrown stones at one of their trucks, so that they intervene in force once again. This time, they have came to the local shop where the evicted people gathered and took away and brutally beat up some of the newly arrived leaders of the the political and environmental awakening movement in Romania. They were detained and beaten up brutally, the camera of one of them was broken. Some 11 more people were arrested. Penal files will be made for many of them and some of them will be arrested with a 29-detention mandate for researches (unlike until so far), like real criminals! The leaders of the camp are targeted! In the mean time, in Bucharest, hundreds took to the street in solidarity with Pungesti! They were fined by the Riot Police right away and they tried to remove people from there using violence. No means are there for people to protest anymore! All types of protest are being denied to the people of Romania and the resistance is brutally abused! We underline, this is no local situation, the whole country is backing Pungesti! What the Romanian dictatorship wanted to do in Pungesti was to have a showcase of repression, so that it opens the way for the rest of the projects countrywide! The Romanian people will not give up the fight, but we need any type of international solidarity! Pungesti camp needs to resist and it will resist! Please help us to make it resist! Spread out the message worldwide that Romanians are resisting fracking and they want to inspire everyone to do so! Today, massive protests throughout Romania will be held. Huge repression from the Riot Police will try to block our protest, just as they have done it before. It's just that this time, it got worse and they are desperate to silence us! The war goes on and we need people to come down here to help us!!! The situation is desperate!